New Mexico will always be the place that made me love mountain biking again. An early convert to the sport, I lost interest while living in Colorado, where riding dirt meant long drives, overcrowded trails, and way too much Spandex. Then I moved to New Mexico. My first Labor Day in Santa Fe—usually the busiest riding day of the year—I rode the most popular trail in town, and saw exactly one other cyclist in 32 miles. I was back on my bike. I quickly learned the local highlights: perpetual S-curves through the junipers; sticky, loamy trails beneath whistling pines; super-sized jackrabbits by day, elk and mountain lions at night. In the seven years since, I’ve discovered hundreds of miles of trails across the state just as good—and just as empty—as that first Labor Day ride. Because of the state’s combination of high altitude and quality trails, lots of pros live and train in New Mexico, which last year became the first state in the nation to formalize a five-feet-to-pass law for cars overtaking cyclists. More mountain bikers will be turned on to New Mexico when the International Mountain Bike Association (IMBA) holds its biennial World Summit in Santa Fe, October 10–13. More trails? The state is already abundantly blessed with them, in terms of both numbers and diversity. Albuquerque’s Foothills network is burned in and well signed. Many of the Las Cruces trails are genuine desert rippers that thread parched cactus-scapes on sand and rock. In Taos, in the course of a few miles, I’ve traversed crackling piñon country up to cool shade beside alpine tarns. Yet you rarely hear people exclaiming over the riding in New Mexico the way they do about better-known spots in the West. And that’s fine. Because while everyone else is cutting each other off in Moab, Utah, and ramming handlebars in Fruita, Colorado, there’s plenty of open terrain on New Mexico’s backcountry logging roads and sinuous trails for switched-on locals to share with enlightened visitors of various riding abilities. There’s no better concentration of high-quality trails anywhere in the state than in and around the capital. The riding is on mostly smooth, almost-manicured single-track (trails wide enough for only one bike at a time). With lots of little loops close to town that link into epic all-day rides higher in the mountains, it’s a destination for beginners and seasoned riders alike. The Dale Ball Trail system, on the east side of town, is the place to start, with 22 miles of immaculate single-track and maps at every junction. The north and central stretches (accessible from the Hyde Park Road trailhead) are less technical, while the southern expanse (from the St. John’s or Cerro Gordo trailheads) has steeper climbs and trickier obstacles. The newly signed roller-coaster single-track through the perpetual sea of hilly scrub pines at La Tierra is another great, accessible spot for novices. And the high-mountain trails that tumble westward down the flanks of 12,000-foot Ski Santa Fe offer a ponderosa-shaded reprieve from the summer heat in the valley. • SHOP Mellow Velo (505-995-8536) (mellowvelo.com)has the largest selection of rental bikes, including hard-tail and full-suspension mountain bikes. The Broken Spoke (505-992-3102)(brokenspokesantafe.com)has some of the best and friendliest mechanics in town. • FUEL UP Cyclists congregate (and caffeinate) at both Downtown Subscription (505-983-3085) and Betterday Coffee (505-780-8059) (betterdaycoffee.com). With strong margaritas and excellent tacos, the rooftop Coyote Cantina (505-983-1615)(coyotecafe.com) is perfect for reloading. With a 23-mile trail system custom-built for mountain bikers, Gallup is New Mexico’s answer to Moab. Northwest of town, the High Desert Trail System twists up craggy cliffs and dives through sandy washes amid red rocks and juniper. The trails are technical enough to merit a full-suspension bike, though the lack of big climbs lessens the pain factor. A series of loops provides multiple bailout options for shorter rides. Though many don’t realize it, Gallup has more than just desert riding. Thirty minutes southwest of town is the McGaffey Lake Recreation Area, where 25 miles of mountain-bike trails link to an even larger network of logging tracks and Forest Service roads. Recently, this area became easier to ride, thanks to two annual endurance races, 24 Hours in the Enchanted Forest and the Zuni Mountain 100, which have brought lots of riders to help break in the trails. Additionally, a local trail-advocacy group has improved the number and quality of trail signs. Expect mellow, swoopy single-track under rustling ponderosas. Adventure seekers should venture beyond McGaffey Lake to search out the backcountry Red Rocks trail, with basins of sandstone that rival Moab’s slickrock. • FUEL UP Camille’s Sidewalk Café (505-722-5017) (camillescafe.com) has reliable coffee and sandwiches; and Fratelli’s Bistro (505-863-9201), on the north side, slings scrumptious calzones bigger than your quads. If banked turns, big drops, and long-suspension bikes are your thing, head for the bike park at Angel Fire, which has the best downhill riding this side of Whistler. 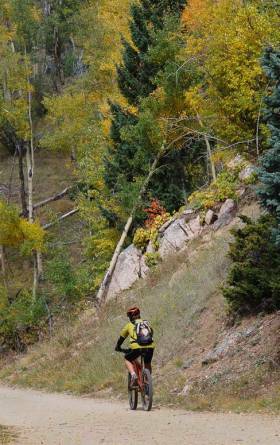 Ski lifts provide access to 29 miles of mostly downhill tracks, though an uphill-only cross-country trail was constructed last season for those who prefer to pedal. The park also added miles of new beginner and intermediate trails, with wide, flowing, banked descents winding through the tall pines, so even riders who don’t want to jump or do tricks can partake. Combi and Sierra are both fun, mellow trails that descend the entire mountain. The park’s signature, however, is the hair-raising selection of steep descents with wooden bridges, loose rocky passages, and jumps that, at the very least, make for great spectating. If you have the skills, Supreme DH (downhill) to World Cup DH will give you a taste of pro-level riding, with 2,000 feet of screaming vertical. It costs $26 for a one-day lift ticket, or $229 for a season Gravity Pass. The park is open long weekends through mid-October, and offers skills clinics and private coaching to those new to the gravity game. Upcoming events include the third annual Freeride Fest on Labor Day weekend; the 12-hour Red Bull Final Descent, September 29; and the Collegiate Mountain Bike National Championships, October 18–21. • SHOP Located at the mountain base, the Angel Fire Bike Park Bike Shop (575-377-4291)(angelfirebikepark.com)rents everything from cross-country to gravity bikes, plus full-face helmets and body armor. • FUEL UP There’s coffee, pizza, and pub grub at the resort (575-377-6401) (angelfireresort.com), and we’re partial to the green chile and enchiladas at Hatcha’s Grill (575-377-7011), in town. This quirky mountain town rivals Santa Fe as New Mexico’s mountain-biking hub, with a great diversity of riding and terrain. Most people come for the South Boundary, a largely downhill single-track run from the fire roads southwest of Angel Fire to the east side of Taos—it’s widely considered to be the best trail in the state. But there are many lower-commitment trails that are just as fun. Rift Valley, on the southwest edge of town, is an easy, flowing loop through the sage, while the West Rim Trail follows velvet-smooth one- and two-tracks south from the Río Grande Gorge Bridge (with stunning views into the canyon below). You could spend an entire season wandering the neglected trails and fire roads in the mountains east of town, but the pay-to-play Northside at Taos Ski Valley ($10/day; 575-776-3233) (ridenorthside.com), which runs up the side of 12,163-foot Frazer Mountain, offers a sweet slice of the action complete with clearly mapped trails, and shuttles ($35/rider; two-rider minimum) in case you don’t feel like pedaling up. • SHOP Gearing Up Bicycle Shop (575-751-0365) offers shuttles for the South Boundary and rents mountain bikes from $35/day. Sunday-morning group rides leave from Taos Cyclery (575-758-5551)(taoscyclery.com). • FUEL UP World Cup (575-737-5299) pulls the meanest espresso in town, and there’s no better post-ride feed than the blue-corn enchiladas at Orlando’s (575-751-1450) (orlandostaos.com). There isn’t a lot of trail at White Mesa—just under 12 miles—but it’s so distinctive and entertaining that you’ll find yourself returning to it again and again. Situated on BLM prairie land an hour north of Albuquerque, just south of the village of San Ysidro, it’s an unlikely destination. At the uninspiring trailhead, you’ll probably wonder why you came. Trust me: Sweat out the half-mile climb from the start and you’ll be rewarded with sudden views of a vibrant lunar landscape of serrated ridges and jagged cliffs. The place gets its name from the gypsum in the soil—and the trail glows like a highway centerline through a panorama painted in rich hues of burnt umber, dusky jade, and slate gray. It’s mostly zippy, big-gear, moderate riding, though the stretches of trail along the ridgeline, with views 500 feet to the valley floor, can induce vertigo—and the optional Center Spine has a couple of drops best left to experts. • SHOP The nearest shop, High Desert Bicycles (505-896-4700) (highdesertbicycles.com) in Rio Rancho, approximately 35 miles southwest of the White Mesa trailhead, has been instrumental in developing and preserving White Mesa. They rent mountain bikes for $50/day. • FUEL UP After a few laps at White Mesa, there’s nothing better than a hearty bowl of macaroni and cheese and a red-velvet cupcake at Flying Star (505-404-2100; flyingstarcafe.com)(flyingstarcafe.com) in downtown Bernalillo. With heavy concentrations of riding in more central spots of the state, it’s easy to overlook way-up-north Aztec and its one-off trail, the Alien Run. But this nine-mile-long loop’s remoteness is part of its appeal: I’ve never seen another rider out there, which makes it feel like a private trail. From a small pump station on an isolated county road, the trail crawls over sandstone swells and plunges through gritty corners as it hiccups along the rim of Hart Canyon, passing an alleged UFO crash site (hence the name) before doubling back on a parallel trail to the north. The south side, with expansive views from the rim into the boulder-strewn wash, is my favorite. Though sometimes sandy, the trails aren’t especially difficult, and there are plenty of smooth, rocky basins to play in, so budget your time accordingly. Unless you’re coming for the eponymous race (held annually in May; alienrun.com), the Alien Run probably doesn’t merit its own trip. But if you’re passing through en route to Mesa Verde or planning a weekend in Durango or Cortez, stop in. • SHOP With locations in both Aztec and nearby Farmington, Cottonwood Cycles (505-334-2703)(cottonwoodcyclesnm.com) is the source for maps, gear, local information, and a smattering of rental bikes ($25–$100/day). Just 50 miles north of the Mexico border, Las Cruces is for desert lovers. The gravelly, hardscrabble trails weave through high grasslands spiked with prickly-pear cactus, century plants, and blobs of golden granite stacked like desiccated snow sculptures. Trails range from smooth, easy single-track to slow-going rock-crawlers, but almost all of them can be hot, dry, and dusty in summer. It’s an ideal winter escape. No matter which trails you visit, expect lots of junctions and spurs and some route finding. The fast-handling, hard-packed Cerro Jornado trails north of town are the place to start. From a small parking lot, a loop of trails climbs up into the desert, though the grades are never that steep and the picked-over trails are easy to navigate. As the trail ascends, vast views of the crackling Doña Ana and Organ mountains unfurl. From the top, the spin back to the car is as easy and entertaining as an amusement-park ride. For more challenge, hit the Horny Toad Hustle racecourse north of town (hornytoadhustle.wordpress.com), or head for the A-Mountain loop, which grinds and stutters over a short but rocky, obstacle-pocked loop on the southeast side. • SHOP Outdoor Adventures (575-521-1922) (outdooradventures-lc.com)is stocked with gear and rental bikes ($20/day), and the local mountain-bike club, Rim Rattlers (lcrimrattlers.org), lists and describes Cruces rides. • FUEL UP There’s plenty of good Mexican food in town, but after a ride, the patio at El Comedor (575-524-7002) can’t be beat for authentic tacos al pastor downed with icy Tecates. Aaron Gulley is a contributing writer to Santa Fe–based Outside Magazine.